What have The Jam, Liverpool and The Cunard building all got in common? They are all iconic. 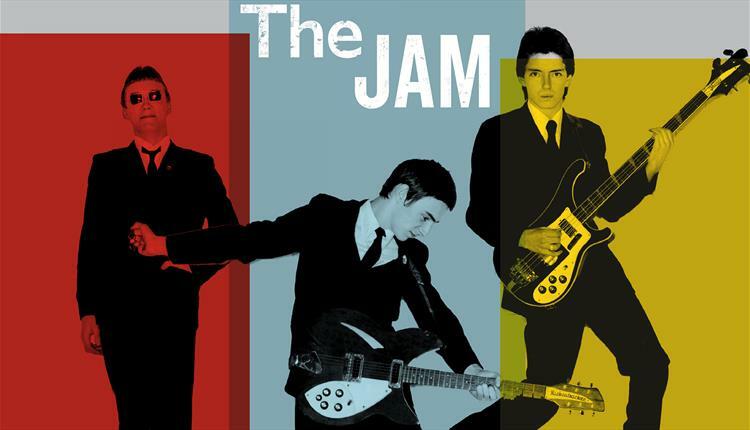 The Jam were the icons of the Mod style with their angst driven, political lyrics representing the English youth of the late seventies. Working class lads done good, playing sell out gigs worldwide. The Cunard building is an iconic landmark, one of Liverpool’s Three Graces on the city’s waterfront, and until the 1960’s the headquarters of the Cunard Line. Liverpool is, of course, the iconic home to Cilla, Merseybeat, and The Beatles, the most famous band in the world. Or are they? I followed three middle-aged men into the exhibition. They were posing for selfies in shades, looking sharp in their Fred Perry Polo shirts and parkas despite the heat. As we waited for the doors to open I asked where they had come from. They had driven from Newcastle that morning and were making a weekend of it. 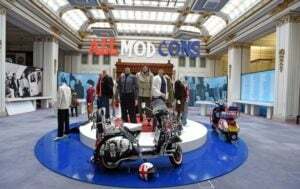 They remarked what an amazing building The Cunard was and it made me realise that the iconic Mod band, who broke so many hearts when they disbanded at the height of their popularity in 1982, had to have their exhibition in one of the iconic Three Graces on Liverpool’s waterfront. You enter the exhibition through a mock tube station tunnel. Already I was humming Going Underground when I came into a gig room where Rick Buckler’s white drum kit takes centre stage. Here you sit and watch recordings of live gigs on huge screens. You can feel an adrenalin rush as we see footage of Paul jumping across the stage, sweating, manically playing his guitar. ‘Welcome to Woking’ is the greeting in the themed gallery space. This room juxtaposes personal ephemera with an installation of a seventies living room. This space is intimate, with family Polaroids carefully placed in cases next to school notebooks and reports. The link with bringing the show up from Somerset House in London to Liverpool was becoming clear. Paul Weller was obsessed with The Beatles, sketching his heroes in schoolbooks. Moving through into different areas, posters and memorabilia confirm The Jam played locally at the Liverpool Empire and Eric’s nightclub. All Mod Cons. Photo Credit: Colin Lane. I smiled at the three Mod men doing selfies against life-sized Weller cut outs. There is a such a huge sense of fun within the exhibition that, frankly, I never stopped smiling. The music is loud as you move into themed rooms based on The Jam’s albums. Visitors are mouthing words and everyone looks happy but the wow factor is when you enter the centre of the exhibition into ‘All Mod Cons’. Mannequins stand proudly on a podium dressed in vintage clothes. Grown men are crying, yes, crying over scooters. Staff members are taking photographs of visitors against a backdrop of a giant red record. From button badges to guitars, from gig ticket stubs to suits worn by the band, the exhibition hits on many levels. Nicky Weller (Paul’s sister) and fellow curators Russell Reader and Den Davies have captured not just the essence of the band for obsessive fans but also those interested in musical culture and social history, as screens show news footage of events of the era. The headset area was busy with visitors sat watching rare clips and interviews, but for me, the last room was the most poignant space dedicated to Paul’s father, the late John Weller, who encouraged the boys to become one of the biggest bands in the world. Coming out into the sunshine, clutching a bag of top quality merchandise, I see the Mod men doing more photographs in their Parkas despite the now intense heat. Well, as the saying goes, ‘Once a Mod, always a Mod’. Due to popular demand, there has been a two-week extension of this exhibit. You can catch About the Young Idea until 9th October.